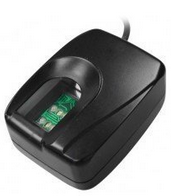 The Logiprint is an USB optical scanner, built with harden crown glass, with 500dpi resolution. It works with the Desk Top Enrollment Software to perform desktop registration of users in conjunction with the AMS application server platform. The Logiprint also works with the GoldFinger software. The GoldFinger, a perfect web-based ideal platform enables time attendance, human resources, ERP, and payroll developers to deliver an integrated fingerprint recognition solution to end-customers. The GoldFinger has a server-based application to manage all remote users clocked by a USB fingerprint sensor. It automatically synchronizes the user data from multiple devices with ease, requiring virtually no input from the user. The developers can focus on developing their applications. Below is the sample diagram on how LogiPrint can work with the AMS Desktop Enrollment software to do users' Fingerprint enrollment and upload to remote Jakin ID device .